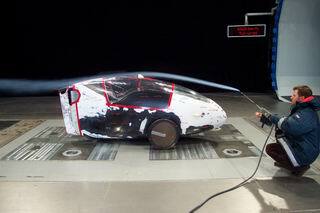 Thanks to the aid of Daimler Chrysler the HYSUN3000 was tested in the wind tunnel the 26th of September 2003. Film teams of the ZDF and fechnermedia accompanied these tests. The goal was to identify the influence of modifications on the chassis to the aerodynamics of the vehicle and to optimize the cw-value. The airflow was visualized with the aid of haze and filaments. The speed parameter was between 60 and 100 km/h. On the bases of these examinations we could collect various experiences, which we are going to use for the further simulation. The cw-value is already at 0,15 - a satisfying result. In the case of side wind it will even be more reduced. The exposition of the Hysun3000 on the H2-Expo was a big success. It was ideal to get in contact with interested people and optional sponsors. The interest of the visitors was great. The enthusiasm was to feel on the place. Peter Rehag, the Hamburg senator for environmental affairs and Simone Probst, German Minister for environmental affairs, were also visiting our stand. They did a test drive and convinced themselves that this record drive is possible. 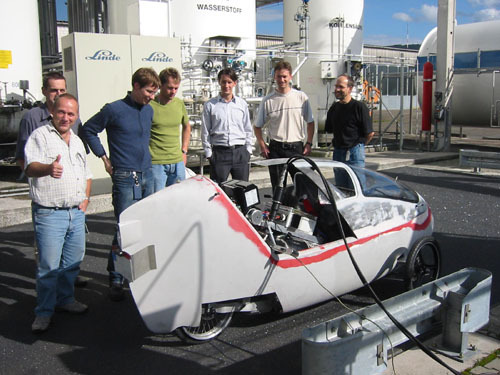 The Fachhochschule Esslingen (FHTE) will support us in the development and optimization of the body of the Hysun3000. Four students will solve technical details like the air vent for the fuel cell module and the way of boarding. A further group will develop a proper gear which copes easily with uphill and even rides during the tour. A third group will create a simulation of the driving dynamic. Therefore we`d like to thank Prof. Dr. Panik, Prof. Wolfmaier, Prof. Gabel and Prof. Gipser for their engagement. In order to realise the communication between vehicle and accompanying vehicle or main station via Bluetooth. Mr. Mark Ital from the TEG gives support for the design of the operation system, the fin and the body gap for the wheel. We will also get support for the lights. Therefore, we have split an order to TEG. First inspection of the new vehicle body design which will be used for the Hysun3000. The body is produced by Aerorider in series using the vacuum technology. With Thorax we discussed about the suspension of the front wheel, the mounting of the rear wheel-drive and its damping. Special thanks to Axel and Ralf Conrad for the successful cooperation. A new integral monocoque truss with rectangular shape will be stabilized by an Aluminium sheet. This new design will cause a higher stability. The new truss will be assembled in the Hysun3000. Environmental protection and alternative of driving drives are also for the recent generation an interesting topic. The Hysun team visited the kindergarden Egelsberg in Weilheim u.T., where 3 groups á approx. 20 children had their first contact with the Hysun3000. They could have a look at the vehicle close-by, admire the technic and learn to understand the technology, sit inside and get so a first driving feeling. In easy and understandable way the technic has been explained very descriptive by Rolf-Peter Essling that the Hysun3000 is driven by a gas which is called hydrogen. It can’t be seen, smelled or touched - however its energy is used. For illustration they received multicoloured balloons filled with helium. The children brim over with enthusiasm for the vehicle, particularly as it doesn’t produce any harmful exhausts and they looked for a long time to find the exhaust pipe of the Hysun3000. When it was finally discovered, the children were completely surprised that only water comes out as exhaust. Again we approached a little our goal to make also the recent generation attentive on pollution free energy systems. The children were pointed out new ways and alternatives for a carefully handling with energy and its use for their future. The HYSUN3000 will start its 3000-km-record-drive on 7th of September in Berlin and will reach Barcelona on 23rd of September. State Secretary Simone Probst represents the German Federal Ministry for the Environment, Nature Conservation and Nuclear Safety and will attend the press conference on 7th of September in Berlin, where the opening of the HYSUN3000-record drive will take place. The record drive is under the patronage of the Ministry. Simone Probst is Physicist and since 1998 she acts as parliamentary State Secretary at the German Federal Ministry for the Environment, Nature Conservation and Nuclear Safety. The HYSUN3000 comes to its last test drives in order to check the electronics. On Friday, 27th of August, TÜV Rheinland will permit the HYSUN3000 for road traffic. The prototype of HYSUN3000 has already the permission for the road traffic and completed several test drives on the road. The vehicle for the record drive will be heavier and more stable and will be the only vehicle driving from Berlin to Barcelona. The HYSUN3000 has been prepared for its record drive and has been filled with gaseous hydrogen under a pressure of 350bar. The tank volume consists of 78l. The approval for road service for HYSUN3000 given by TÜV Rheinland is the first in the category of a fuel cell vehicle with an empty weight of 187 kilograms. The max. speed is restricted to 80 km/h. The HYSUN´s approval for road admission is the success of the HYSUN-Team developing the vehicle self dependently and complimentarily. The HYSUN3000 is the first fuel cell vehicle of the world with official approval and homologation for road service, passing a distance of 1643 kilometers with just one tank filling of hydrogen. 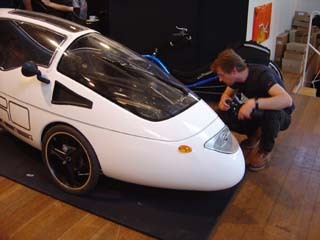 The consumption of hydrogen of the HYSUN3000 is 110g per 100km and the equivalence of gasoline is 0.41 Liters per 100km. The current results point out, passing the distance of 3000km with 3kg hydrogen is a realistic target. The HYSUN3000 is the first fuel cell vehicle with official approval and homologation for road service of the world passing a distance of 3000km with 3,3kg hydrogen consumption in total. The vehicle kept its consumption of 110g hydrogen per 100km throughout the entire tour (equivalent to 0.4l gasoline per 100 km). Therewith the HYSUN-team has achieved its main goal with the fuel cell vehicle: the distance of 3000 km was passed with only 3,265kg of hydrogen. The World Mobility Forum took place from 1.-3. of February 2005 with the topic 'China and the Asian region'. Decision-makers from all sectors of society and science discussed at the World Mobility Forum in order to address the burning issues of mobility worldwide and to indicate how they should be tackled in the near and distant future. 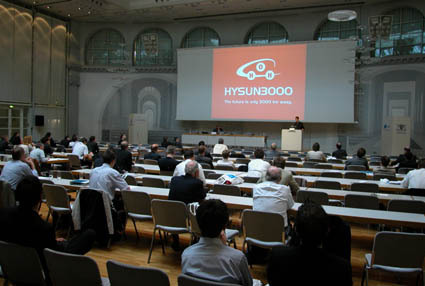 Also the team of HYSUN3000 presented the vehicle and project in Stuttgart. Der HYSUN3000 was at the Thüringen Exhibition in Erfurt from 26.02.-06.03.2005. 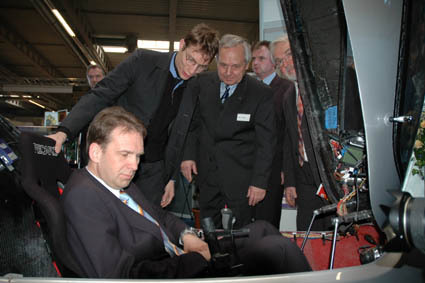 Prime Minister of Thüringen Althaus (photo) sat into the HYSUN3000 and projekt manager Frieder Herb (photo left) explained the basic skills of driving the vehicle. 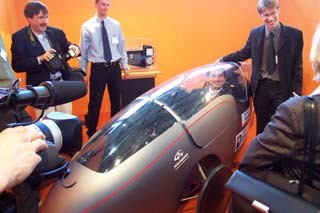 Professor Bley (mid of photo) - joint founder of the Solar-Village Kettenmannshausen e.V.- was also interested in the vehicle. The Thüringen Exhibition is the biggest exhibition in Thüringen and is targeted on demanding visitors. After coming back back from Barcelona, the HYSUN3000 was presented on the 'f-cell' Symposium in Stuttgart (28th of September). The forum adresses europe-wide manufacturer and user of fuel cells. Project Manager Frieder Herb referred about the results of the tour. The project met with approval under the experts. The 'f-cell' Symposium associated with a fair takes place since 4 years. In the year 2004 more than 32 exhibtors and approx. 500 international visitors attended the event. Frieder Herb and Jörg Schweigard lectured about the record drive of the HYSUN3000 at the VDI-event organised by the Württembergischer Ingenieursverein e.V. (WIV) / working package for society and technologies. 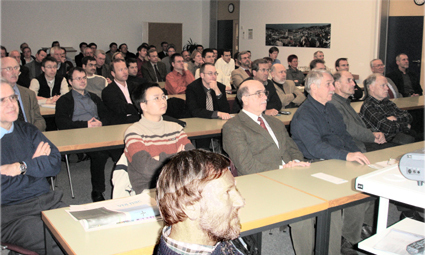 The event took place on 18th of March 2005 in Stuttgart-Vaihingen. More than 70 people attended the lecture and were very interested into the project. The HYSUN3000 was to view in the VDI-building in Stuttgart-Vaihingen until 21st of March. The HYSUN3000 was to view at the Hannover Fair at the booth of IGUS GmbH, a sponsor of the HYSUN-project. 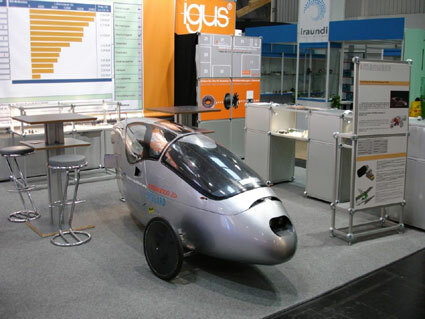 Sincere thanks to IGUS GmbH for the exhibition of the vehicle. Many visitors were attracted by the HYSUN3000. 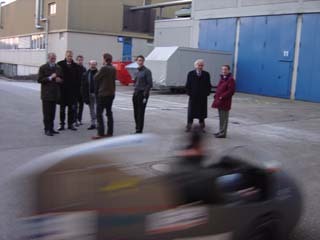 The Lucerne FUEL CELL FORUM 2005 was a highlight of the European fuel cell year. Venue place was again the new 'Kultur- und Kongresszentrum Luzern' on the waterfront of the Lake of Lucerne in the heart of Switzerland. Two parallel conferences, a fuel cell product exhibition and an optional fuel cell tutorial are offered under the same roof. There was unlimited access to both symposia and the exhibition. Many exhibitors and prospective customers attended this important event in order to bring forward the seminal fuel cell technology. The „Forum Region Stuttgart“ offered an event 'Tour of Know-how' with focus of 'energy' from 29.07. until 31.07.2005. Finally the Forum honoured the HYSUN-Team for its project, the construction of the HYSUN3000 and its Europe-wide tour in order to inform the public about the fuel cell technology. With the award 'region’s sights' the Forum emphasized the meaning of this engagement. In Germany f-cell is one of the most important events for fuel cell and hybride technologies. f-cell offers a broad program with an international Symposium and a trade fair covering the total topic. The HYSUN3000 will be to see at the exhibition and the HYSUN-Team is looking forward to seeing you there!